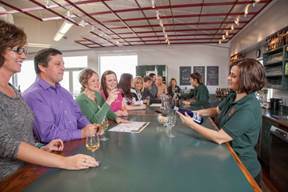 Customers enjoy wine tasting at Tassel Ridge Winery in Leighton, IA. Tassel Ridge was a cooperator in the tasting room customer satisfaction survey. Customer satisfaction is especially important for the cold climate wineries; as an emerging industry, it relies on visitors (regional customers and tourists) for an important share of total sales. By ensuring that customers have a satisfactory experience, the winery can create customer loyalty and positive press as clients recommend the establishment to their friends, colleagues and family. In the winery business, customer satisfaction is primarily determined by the tasting room experience, as tasting room visitors are not solely interested in the wine. The study, led by Miguel Gomez at Cornell University, was conducted in six wineries in New York and Iowa, which collected surveys from tasting room customers from June through November 2012. 1) Determine which factors drive customer satisfaction among local wineries in the emerging wine regions of New York and Iowa. 2) Identify the linkages between customer satisfaction and sales performance within these wineries. The team found that a focus on customer service was the most effective strategy to increase customer satisfaction scores, and that “highly satisfied” visitors purchased an additional bottle of wine and spent $10 more per visit, compared to “satisfied” visitors. April 9, 2013 webinar by Gregg McConnell and Miguel Gomez. Miguel’s portion of the webinar, “Customer Satisfaction Drives Tasting Room Sales,” starts right around the 30 minute mark. Gregg’s portion of the webinar, “Towards Startup Winery Profitability: When do I start Making Money?” also has a lot of great information, although it is not directly related to customer satisfaction. This entry was posted on Tuesday, January 6th, 2015 at 3:57 pm and is filed under Grape. You can follow any responses to this entry through the RSS 2.0 feed. Responses are currently closed, but you can trackback from your own site.